This chapter will present the Solar System as it exists today, and hopefully will give you some idea of relative sizes and distances -- which are almost beyond the imagination. 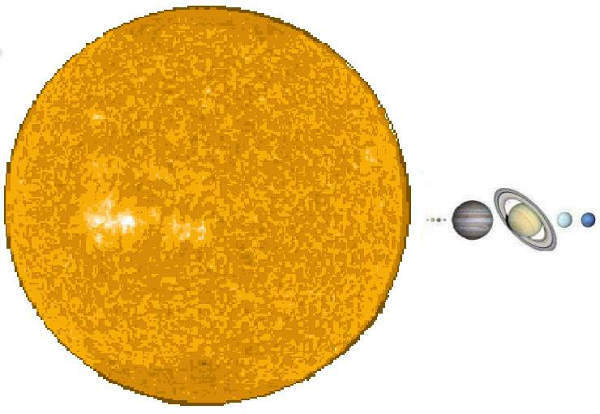 The distances in the Solar system are absolutely huge, while the sizes of the planets are microscopic compared to the Sun. Distances to the stars and galaxies are far, far greater yet. I shall follow this with an overview of the peculiarities of the Solar System to suggest that there is something wrong. The Solar System looks more like a train wreck than a carefully crafted clock. Next, a description of how Saturn may have first entered the Solar System before the Cambrian, repeatedly returned at intervals of millions of years, and then in the last three million years returned to stay. Last, I will suggest that the rise of complexity in life-forms after the Cambrian is due entirely to the periodic entry of Saturn into the Solar System. The series of glaciations, which started some 3 million years ago (mya), continued intermittently until very recently, indicating that Saturn had remained in the neighborhood of the inner planets during that time. This period gave rise to a dozen species of hominids, of which we are the last survivors. That will be covered in the next chapter. Cosmologies are models of how things work on the grand scale of everything. Cosmologies thus propose to explain the workings (and origin) of the Universe, the Solar System, the planets. We should start with the accepted model. To understand where everything came from -- in terms of the "accepted cosmology" -- it would benefit the reader to be familiar with Bill Bryson's book A Short History of Nearly Everything (2003) which makes easy reading and will inform you properly. The book starts with the "Big Bang" and progresses, in following chapters, through atomic physics, geology, evolution, and the history of the hominids. (The development of humans in historical time is not covered.) Of particular interest are the vignettes which illustrate the personalities of the people and the processes involved in the ideas which have become current. I could list a few objections -- for example, on the first page Bryson has creation starting from "a singularity" at the beginning of time, that is, at the start of the Big Bang. A singularity, however, is a mathematically undefined point, which here becomes a physically defined point. An undefined mathematical point, like in dividing by zero, starts yielding infinities but that does not mean that it contains the whole infinite Universe. However, it doesn't matter; this is an abbreviation by a popular writer and, overall, the book is captivatingly written. Occasionally you will run into a statement which clashes with all of common sense, like, "At this point, 4.5 billion years ago, an object the size of Mars crashed into Earth, blowing out enough material to form a companion sphere, the Moon." (Only astronomers would have fantasies like that.) However, as I progressed through the book (and came ever closer to the world of today) I had fewer and fewer objections. I'll describe the current Solar System and its planets further below. A very important alternative to the handed-down cosmology is the book by David Talbott and Wallace Thornhill, Thunderbolts of the Gods (2004), promoted, along with other titles (shown below), at [www.thunderbolts.info]. Talbott and Thornhill worked with the editorial team of Amy and Mel Acheson, Dwardu Cardona, Ev Cochrane, Walter Radtke, Don Scott, C.J. Ransom, Rens van der Sluijs, and Ian Tresman (all editors, publishers, and contributors to the Kronia site, Thoth newsletter, Aeon magazine, and the SIS). Together these people represent an enormous block of knowledge. The theory dates to the electric theory of Michael Faraday (1791 - 1867), the investigations by Johann Geissler (1814 - 1879), and the mathematics of James Clerk Maxwell (1831 - 1879), and specifically to the plasma concepts of Kristian Birkeland (1867 - 1917), Irving Langmuir (1881 - 1957), Hannes Alfven (1908 - 1995), and Charles Bruce (1927 -1969). I recommend Don Scott's recently published book, The Electric Sky (2006), which details the plasma concepts at planetary and galactic levels. It may be the first time this information has been brought to general readership even though the concepts have been around for 150 years and have been part of electrical engineering curricula for as long. Talbott and Thornhill followed up their original book with The Electric Universe (2007), which represents an excellent introduction to plasma and the electricity of space, the sun, comets, and planets. "... my impression has been that much of what Thomas Kuhn has called 'normal science;' has degenerated into mindless support of orthodoxy and the so-called 'consensus of opinion,' which is arrived at by a process of one scientist repeating what another has said in a kind of mirror-gallery regression for the fear of falling out with his (or her) colleagues. In the end nobody seems to know how this 'consensus' has originated, but anything that is out of step is ruthlessly suppressed." -- V. Axel Firsoff, writer and astronomer (1910 - 1981). "Alternative for the origin and nature of the universe; deductive models for the origins of stars, planets, moons, comets, asteroids, meteoroids, rings, Sun and planet spots; the latest on the hypothetical "tenth planet" beyond Pluto; an alternative to the Oort cloud of comets and the "dirty snowball" comet model; and much more. Since the book deals primarily with observational puzzles and anomalies that don't fit conventional models, many viable alternative models are described." Van Flandern's main contribution is a "planetary breakup hypothesis as the origin of asteroids and comets," and he offers several mechanisms which might result in a breakup (explosion) of a planet. I think his most interesting theory deals with the formation of planets (and satellites) as expulsions from stars. He uses a model based on mechanical interactions. The results are close to the "electric universe" model and could probably be integrated with the latter. I will return to this further below. Among astronomers, Van Flandern is the dean of gravitational theory. Van Flandern believes comets are solid and thus predicted that when an 800 pound projectile was to be fired from the spacecraft Deep Impact on July 4, 2005, to impact Comet Tempel 1, it would make a small dent only, and vaporize the copper anchor. The NASA space folks predicted that the anchor would blow straight through the "snowball" nucleus of the comet. My money was on Tom Van Flandern, and his predictions proved correct. Thornhill also accurately predicted the energy exchange, the flash, and other "surprising" results. See my notes on this at the Appendix "Deep Impact." Additionally, Van Flandern's book (and his website) address more speculative matters, such as gravity, quantum physics, and the Big Bang. He follows Halton Arp on red-shift. See [www.haltonarp.com]. Arp is an observational astronomer who has compiled an extensive array of data which shows the failure of the accepted relationship between red-shifted light and speed of recession for galaxies. Arp has also demonstrated that galaxies give birth to other galaxies, in pairs, along their rotational axes. See his book Seeing Red (1998). To understand the Solar System, we will need a sense of scale, but the representation of the Solar System in any graphic form is difficult. None of the orbits of the Solar System can be drawn to a scale which will show planet sizes at the same time. Below, however, is a scaled presentation -- the Burnham model -- which places the orbits to within a double arm span, although using invisibly small specks for planets. The following, the "Burnham Model," is from Don Scott's website at [www.electric-cosmos.org]. We need to start with two facts: the radius of the Earth's orbit, called an Astronomical Unit (AU), 93,000,000 miles (150,000,000 km), and the speed of light, 186,000 miles per second (300,000 km/sec). "We sketch the orbit of the Earth around the Sun as a circle, one inch [25 mm] in radius. That sets the scale of the model. One light-year is one mile [1.6 km] in this model." A light-year is the distance traveled by light in a year -- 63,240 AU, which is 5,878,630,000,000 miles. An inch represents an AU, and thus 63,360 inches (a mile) almost exactly represent a light-year. "The Sun is approximately 880,000 miles in diameter. In the model [this] scales to 880,000 / 93,000,000 = 0.009 inches [about 1/4 mm]; (Approximately 1/100 of an inch in diameter). A very fine pencil point is needed to place it at the center of the (one inch radius) circle that represents the Earth's orbit." Neglecting Pluto, the remaining planets all fit within a radius of three feet [a meter] from the pencil-point Sun. "The nearest star to us is over four light-years away. In our model, a light year is scaled down to one mile. So the nearest star to us is four and a half miles away in our model. So when we model our Sun and the nearest star to us, we have two specks of dust, each 1/100 inch in diameter, four and a half miles [7.2 km] apart from one another. And this is in a moderately densely packed arm of our galaxy!" Reflect on this for a minute. These distances are absolutely astounding. The light of the Sun takes 8 minutes to reach us, traveling 186,000 miles per second (300,000 km/sec). A space ship traveling at 20,000 miles per hour (32,000 km/hr) (which is the minimum required to break away from Earth) would reach the Sun in about 150 days. The same ship traveling to the nearest star would arrive more than 100,000 years later and then would look for a place to land. [Image: Relative sizes. These are not the distances between planets. The Sun and the other planets are shown to scale above. The Moon, not shown, is a little smaller than Mercury -- the small dot next to the Sun. The table below combines the sizes of the planets with the distances from the Sun. It is amazing to realize how tiny our domain in the Solar System is. An AU, below, is 93,000,000 miles. The puzzling thing about our Solar System is that the thinly spread-out planets beyond Mars seem at odds with what little we know of other star systems where the planets which have been detected are very close to their star, although it is possible that we just have not noticed the outlying planets of other systems. We have, in fact, not seen any of the planets of any other stars, we have only observed the transits of the primary (a brief dimming of the star), or the gravitational disturbance these planets produce to their stars (a back and forth movement). All the planets travel about the sun in nearly the same plane, more or less at the Sun's equatorial plane, in a band called the ecliptic, which is actually defined as the plane of the Earth's orbit. Thus, seen from Earth, the Sun also travels in this band in the sky. The ecliptic is relatively easy to spot in the night sky if one or two planets can be found. Because the Earth's rotational axis is tilted, however, the ecliptic looks tilted and wobbles across the sky on a daily basis, and differently at different times of the year. Only at the equinoxes (March 21 and September 21) does it stand still, stretching from directly east to directly west. In addition to its wobble, the ecliptic is inclined at an angle. It rises up from the southeast at an angle in mid winter, and six months later it rises out of the northeast. The height above the south horizon (in the northern hemisphere) depends on the latitude from which it is viewed. At the equator it mostly stands almost directly overhead, and shows very little wobble. Near the North Pole all of the ecliptic shows above the horizon during summer, not at all during winter. As a result, the days and nights are nearly equal during all of the year in the tropics, and days get longer with summer (and shorter with winter) the further north one is located. All the planets orbit about the Sun and rotate about themselves in the same direction -- counterclockwise as seen from far above the North Pole of the Sun or the Earth -- except Venus, which slowly rotates backwards around itself, and Uranus, which seems to be lying on its side. All the planets travel in ellipses about the Sun, but it would be impossible to tell these ellipses from circles at any visual scale, with the exception of Mercury, which doubles its distance from the Sun over the course of each orbital rotation. The planets closest to the Sun travel the fastest. In the conspicuous gap between Mars and Jupiter there orbit millions of rocks and asteroids -- an accident of the remote past. Our Sun is a star. The next nearest star in the Milky Way (our galaxy) is 4.5 miles away on the scale of the Burnham Model presented above -- another speck of dust -- but 4.5 light-years in actuality. This is a distance of 26,400,000,000,000 miles -- 26.4 * 10 exp 12 miles (42,500,000,000,000 km). The Milky Way galaxy contains billions of stars. The distance to the nearest galaxy is incomprehensible. There are billions of galaxies beyond that. Simulations of space travel as seen in films are wildly inaccurate, but they are part of popular culture, part of how we view ourselves as "in control," even of galactic distances. Stars flit by on Star Trek, yet the stars would not noticeably move even at 1000 times the speed of light. This perception of space as conquerable and controllable results from the fact that planet sizes and interplanetary distances, and by extension the distances involved in the Universe, cannot be properly imagined in our minds. Big numbers just remain meaningless big numbers. The emptiness of space, the distances between planets, and the diminutive sizes of the planets in relationship to the sun, will remain meaningless unless they can be seen and experienced. This requires a very large-scale model -- small enough to see the distances, yet large enough so that the planets do not disappear altogether from sight. The distances, the magnitudes, and the emptiness involved in our diminutive occupation of a small parcel in an outsweeping arm of a remote galaxy, calls for a reduction of these dimensions to a physical model which, if it could be seen, might evolve in our minds some reasonable concepts about the relative magnitudes. The distances involved in our solar system are so large as to be virtually unimaginable and as a result meaningless. Stellar distances are 5 orders of magnitude (100,000 to 1,000,000 times) larger yet. The Burnham Model is a valiant attempt to visualize the distances. The next table lists the inclination of the axes of rotation of each planet to each planet's orbit (actually the deviation from the perpendicular to the orbit), the inclination of the orbit to the ecliptic, and the eccentricity of the orbit. Since the ecliptic is defined as the plane of the Sun and Earth, the "inclination of the orbit to the ecliptic" is a rather strange measure which in effect places the Earth at the center of the Universe. I have also shown the inclination of the orbits of the planets to the equator of the Sun (by subtracting this from the inclination of Mercury which orbits the Sun at its equator, 7 degrees from the ecliptic). Mercury revolves at the equator of the Sun, but its orbit is understood to be inclined by 7 degrees from the ecliptic. The ecliptic is defined as the plane of the Earth's orbit. The inclination of the Earth's orbit thus deviates by zero degrees from the ecliptic but it is actually at an angle of 7 degrees to the Sun's equator. 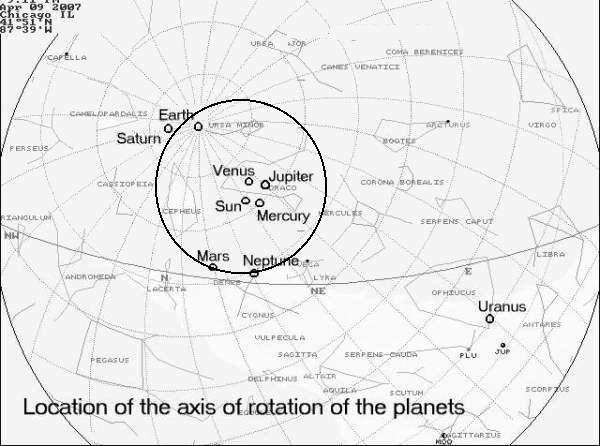 The discrepancies in the rotational axes of the planets show more clearly if they are all compared to the rotational axis of the Sun. In the chart above, by adding 7 degrees to the inclination of the orbit to the ecliptic ("A" in the chart above) for each of the planets, the orbital inclination of a planet to the equator of the Sun ("B") is found. By adding the inclination of the orbit to the equatorial of the Sun ("B") to the inclination of a planet's spin axis to the orbit ("C"), the amount that a planet's spin axis differs from the spin axis of the Sun ("D") is found. As can be seen, Mercury is the Sun's moon, and the only planet which behaves appropriately as a satellite. The spin axis of Venus is almost parallel to the Sun, but upside down. In that the spin of Venus has been measured as slowing down, it will become another Moon of the Sun in the far future. Jupiter is at an angle of 8.8 degrees. All the remaining planets are tilted at 30 to 32 degrees with respect to the spin axis of the Sun. The congruence of the tilt of the axes of four of the nine planets becomes even more noticeable when it is realized that all fall to within a degree of each other. Nothing currently explains why the rotation of Venus is backwards, or why Uranus lies on its side. Nothing explains why Mercury rotates at all, except that it is obviously the Sun's moon. The Earth's axis of rotation today points to the star "Polaris" in the constellation Ursa Minor. The axis of rotation of the Sun points to a location a few degrees east of the main part of the constellation Draco. Jupiter, Mercury, and Venus all point to the same region of the constellation Draco as the axis of the Sun. It is fairly certain, however, that Venus is not part of the original Solar System. Only Jupiter and possibly Mercury and the Moon are the original satellites -- that is, the planets -- of the Sun. There were originally three or more additional planets, of which the asteroids are the remnants. Reasons for considering Venus as a recent addition to the Solar System will be made clear in a later chapter. Uranus has an axis of rotation which falls about 95 degrees away from the axis of the Sun because it is lying on its side (actually 10 degrees below the ecliptic). I will suggest in following chapters that this has been the case since remote antiquity. It can be traced back to the Upper Paleolithic, and was likely seen by Homo erectus. After the Precambrian (560 million ya) and before the Triassic or Jurassic (200 million ya), when Earth was still traveling with Saturn, the infrequent excursions into the Solar System would radically change the heat and radiation received by the Earth as Saturn approached the Sun and changed its coma (for periods of perhaps 15,000 years at a time). The orbit of Earth around Saturn might have been altered, accounting for some of the long-lasting climatic changes. And Earth would become suddenly subjected to plasma discharges from Saturn at arc level as Saturn got yet closer to the Sun -- with all the attendant results. Certainly such events would cause some massive global changes -- severe changes in climate and geological disturbances. It apparently was the cause of the periodic extinctions and subsequent speciation. If the plasma arc is localized, it will burn giant craters on land surfaces, vaporize material, raise stupendous clouds of dust, and explosively launch the dust but also large rocks. It will change the climate. If the arc strikes water it will bring ocean water to a boil, raising clouds into the stratosphere which will condense to snow or freezing rain. If this happens near land an ice cover will form, with a much longer climatic effect. Conditions on Earth would be stable for very long periods of time, and then Saturn would reappear in the sky and a brush with death would ensue for the planets near the Sun. The enormous changes in the Earth's climate over the last 500 million years attest to this. In addition, planets do not collide, for they are each protected by their electric field, that is, by their plasmaspheres. Planets do not see each other electrically unless the outer edges of their plasmaspheres touch, generally involving the plasmasphere tail of one planet. Then the plasmaspheres reform, the difference in charge between the two planets, now enclosed in a single plasmasphere, will cause a sudden stupendous repulsive electric field impulse (force). The shock of sensing an electric field is instantaneous and massive. A planet like Earth could be moved to a much larger orbit -- 15,000,000 miles (24,000,000 km) further from the Sun, as in 1492 BC. This would be followed with an attempt to equalize charge -- resulting in an arc between the two planets which could travel millions of miles. In the case of Saturn and Earth, the arcing lasted for a thousand years. The answer apparently lies with the unique combination of our particular distance from the Sun (which actually is not all that critical), the existence of a magnetic field, lots of water and atmospheric water vapor, an atmosphere, and a fast spin. Earth and Mercury are the only inner planets with a magnetic field. However, Mercury has only a very slight magnetic field currently. And Mercury also is but a small dried-up prune of a planet, nearly standing still, baked ceaselessly by the Sun, and only a little larger than our Moon. It is the Sun's moon. No hope for life there. We were also saved from possible obliteration during the nova event of Saturn in 4077 BC by being located below Saturn rather than at its equatorial plane. Otherwise the nova blowout might have brought humanity to an end, like a similar nova event nearly obliterated all life at the end of the Permian, 250 million years earlier, when Earth was still orbiting Saturn at its equator. At that time Earth suffered plasma discharges at equatorial level to the shallow seas of Central Africa or the Sahara, resulting in a glacier which covered South America, North Africa, and India -- which were joined together at that time. 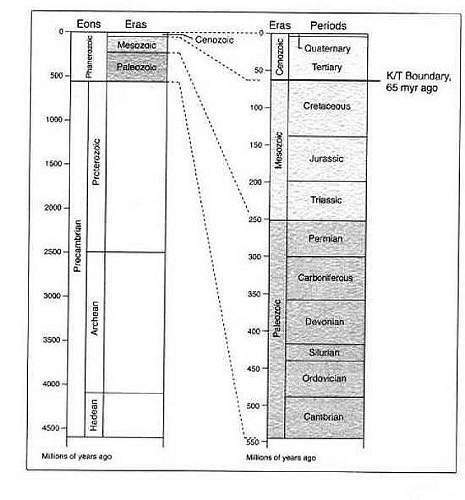 For the sake of readers not familiar with terms like "Precambrian," "Permian," and the like, I am reproducing a chart of the biological and geological ages of the Earth below -- to scale. [Image: Geological and biological eras of the Earth. The last 500 million years represent most of the complex life-forms of the Earth; the very last portion of which represents the era of modern humans. A few billion years ago, the Earth must have been in a condition similar to what Venus experiences today -- a cooling crust, unremitting volcanism, ceaseless lightning, and a turbulent poisonous atmosphere -- conditions which grind rocks to dust and build landscapes. Add water to this mix, and couple it with extreme electric conditions, and you have the makings for the genesis of life. This will probably happen on Venus but it will take some billions of years. first animals with hard exoskeletons. - 350 mya: Devonian. First land plants and animals. - 250 mya: Permian mass extinction. These same conditions were probably what first brought complex molecules and self-replicating molecules into existence on Earth. Experiments with a reducing hydrogen atmosphere, methane, ammonia, water, and an electric arc have produced many of the organic compounds which form the basis of life. This is, in fact, a popular high school Science Fair experiment. More complex versions of this experiment have produced the long-chained polymer molecules which are also needed and recently have generated cell-like enclosures and the basics of RNA. The probability of achieving a living organism is not all that astronomically high. However, no one has had the time to run the experiments for a half billion years. But Earth did run these experiments, for nearly 4 billion years. During almost all of that time, "life" never went very far beyond the simplest forms. The "progress" was incredibly slow. And it occurred in two or three spurts. Most of the 4-billion-year-long era is called the Precambrian and it extends over nine-tenths of the history of the Earth. Early life-forms may not even have had cell walls. But after a half billion years, 3.2 billion years ago, the first cellular organisms (prokaryotic cells) show up in the geological record. These are simple microscopic single-cell forms, akin to bacteria and blue-green algae. They have cell walls and a single chromosome, but no nucleus. There is also evidence of very early photosynthesis pointing to the slow creation of atmospheric oxygen (although the Oxygen may very well have been extant). The three discontinuous steps in the development of cellular complexity are approximately 650 to 700 million years apart. The geology of the Precambrian follows a similar series of geological alterations at 700 million year intervals, paralleling the development of life-forms. I suspect that the cause of each of these alterations was a mass expulsion and severe plasma blasts initiated by Saturn -- a nova event. Many organisms continued to exist throughout the Precambrian because the life-forms remained below the surface of the Earth's waters. At the close of the Precambrian we see another massive destruction of the terrestrial landscape. Following this is the most impressive diversification of the complexity of life ever. It is as if species spring up out of nowhere. Some 40 animal phyla show up for the first time, although some may date from before the Cambrian. But only 34 of them last through the extinctions of the following 500 million years, and no new phyla are ever established again. The genesis of life (barring the complexity of the Cambrian) may very well be a condition regularly experienced by planets throughout the Universe. The process is almost predictable. Certainly the chemistry -- methane, hydrogen, and carbon dioxide gases, water, and electric discharges -- is common, and most of the planets that we have detected elsewhere are close enough to their star to receive heat from their primary. The Earth today would still be largely populated by the ocean-bottom plants and animals of the Precambrian -- seaweed, sponges, and worms -- if it had not been for the much more frequently repeating series of plasma discharges which started some time after the Cambrian. These were completely different from the infrequent novas; they involved attempts at charge equalization by Saturn on reaching the neighborhood of the Sun, a space that was regularly traversed after the Cambrian. Plasma flow is limited by the short time duration that Saturn was relatively close to the Sun on its path through the Solar System. I would vote for life being almost universal throughout the Galaxy. But I doubt if any of the life-forms will ever get beyond the simplest organisms. It is likely that life anywhere else will never go beyond sponges and trilobites. The "ancient maps" controversy involves an interpretation of the Piri Reis Map of 1513. Some authors claim that the map shows an ice-free Antarctica. This was used in books by Graham Hancock as evidence for Antarctica once having been Atlantis. "We stand at a time in scientific history that will be embarrassing to look back on from the vantage point of the next century. An entire subgroup of science consisting of a majority of astrophysicists and cosmologists is now -- and has been -- smugly ignoring the fruits of 150 or so years of electrical science. This subgroup feels perfectly confident in postulating the existence of processes and entities that cannot be verified experimentally in earthbound labs. But that doesn't mean those processes can't happen in space, they say. When there are perfectly valid electrical explanations for certain phenomena, it is irresponsible to ignore those explanations and invent new science to avoid using them. People will ask, years from now, How could they have ignored electricity in space when it was staring them in the face?" "Classic astronomy (and its offshoots: helioseismology, astrophysics, cosmology, etc.) have never made any real predictions that turned out to be true although they are past-masters at inventing dynamos and invisible entities to explain things retroactively. After-the-fact explanations are easy, especially if you can get away with saying, The hidden dynamo did it ... [C]lassical astronomers were wrong about how the auroras are powered, about the temperature of Venus, about the rocky nature of comets, about x-rays coming from comets and other objects, about the existence of natural radio emissions from the planets. And I claim they are wrong about many things they are now saying about the Sun." "Our past is not reconstructed by archaeologists and historians, but rather constructed. Archaeological facts cannot speak for themselves. Rather, the material remains are marshalled, compared and manipulated by scholars who are active participants operating within their own social contexts to support mutually inclusive and exclusive hypotheses of past behavioral patterns. The archaeological record is malleable, although we can accept that a cattle bone is 25 mm, that a stone tool is made from a particular raw material and that rock art is concentrated in one area but not another. Thus empirical observations and measurements constrain and frame the viable hypotheses which may be adequately derived from the data sets, although questions must always be asked as to why certain criteria (observations and measurements) were applied in order to prevent a degree of bias as far as possible." "The current inventory of the moons (satellites) of the giant planet is as follows (information extracted from Jewitt, Sheppard, and Kleyna, "The Strangest Satellites in the Solar System," Scientific American, August 2006, pp. 41-47):"
Jupiter: 8 regular moons; 55 irregular. The diagram above compares the spin axis of the Earth with the spin axis of the Sun. The diagram would represent the mid-winter position along the orbit, when the plane defined by the spin axis of Earth and the radius of the orbit is perpendicular to the plane of the orbit. By adding the inclination of the orbit to the equatorial of the Sun, 7 degrees, to the inclination of the Earth's spin axis to the orbit, 23.5 degrees (known as its obliquity), the amount that the Earth's spin axis differs from the spin axis of the Sun is found to be 30.5 degrees. Of course the condition of having the winter solstice at the "lowest" part of the orbit with respect to the Sun's equatorial (as shown above) does not happen in actuality. But since the orientation of a planet's spin axis in space does not change with travel along its orbit, the calculation is valid even though the diagram represents the equivalent of a thought experiment. The Moon just does not fit. The tabular data shown further below. The geometry for the Moon assumes that the spiral path around the Earth is also an orbit around the Sun. The distance the Moon travels above the Earth (and thus above the ecliptic) can be found from the radius of the Moon's orbit and the maximum angle made with the ecliptic as seen from Earth, 238,757 * sin(5.145) = 21,410 mi. The Moon falls below the Earth by the same distance six months later. The orbit of the Moon is a disk differently inclined to the orbit of the Earth, and thus at an angle to the ecliptic. Measured from the Sun, the inclination of the Moon's orbit with respect to the ecliptic can be found as the arctangent, arctangent(21,410 / AU) = 0.013 degrees. The obliquity of the Moon to its orbit around Earth is 6.7 degrees. This is the angle of the rotational axis of the Moon with respect to the equivalent orbit around the Sun. Although the spin axes of Earth, Saturn, Mars, and Neptune all point to locations of the sky which are 31 degrees away from where the axis of the Sun points, it is curious that they are not bunched together. It is this last which would be expected if indeed it is difficult to change the spin of a planet and if all the Saturnian planets came into the Solar System pointing initially to the same location among the stars. Although today the locations where the axes of these planets point are different from each other, they are all about the same angular measure away from the axis of the Sun. This suggests that, if the axis of a planet is to swing to a new location, it would follow a path which describes a circle which has as its center the rotational axis of the Sun. The question remains, Why would this be so? The only significant physical element in the Solar System which could perhaps have the property of always pointing in the "up" direction of the Sun, might be an up-down magnetic field experienced at the location of the Sun's equatorial disk (which has not been detected). Combined with a radial current flow at the level of the Sun's equatorial (for which the solar wind would qualify) this would provide a force moving the planets forward. This is the right-hand rule of electricity and magnetism (F = B x I, where F, B, and I are vectors). However, things are not likely to be that simple. Additionally, there is the curious phenomenon of the precession of the Earth's axial inclination, which advances the Earth's axis in a circle, and is known as the precession of the equinoxes. The center of this circle, which has been confidently defined by astronomers, is the selfsame circle where half the planet axes are located, and which has as its center the rotational axis of the Sun. However, the precession is caused by the Earth's Moon, the only satellite of any planet which, with every rotation, moves out of and back into the planet's plasmasphere. The disturbance is real (and has been observed since late antiquity), and has been noted to change in the past or drop to zero. But the disturbed axis of the Earth remains at an inclination which keeps it on the 30-degree radius circle about the rotational axis of the Sun. The often-mentioned notion that the inclination of the spin axis of Earth and Mars are the same, is a fiction. The angles have a close numerical value, but, as can be seen from the diagram in the text, they point to entirely different locations in the dome of the stars. Rather than the axial inclination of the two planets being nearly identical, in reality they differ by over 40 spherical degrees. This assumes that there was some random distribution of the inclination of the orbits of the planets from a very early time. Saturn and Jupiter have enough rotational (spin) momentum to have remained undisturbed for a very long time, measuring into the millions of years. Since gravity is a spherical field, nothing would disturb the orbital inclination of a planet once a particular inclination is initiated, except the minor gravitational tugs by the large planets. The wild card in all this is that Saturn came to the Solar System with a large positive charge, unlike the solar planets. Saturn could attract other planets. The Huygens space probe, launched by the Cassini space ship, has determined a methane, nitrogen, and carbon dioxide atmosphere for Titan in January 2005. Hardly poisonous, but not exactly benign. Earth has very few "meteor craters" -- only a dozen have been identified. Venus, similarly, has few small craters. The distance that the Earth is from the Sun will make the overall climate warmer or colder, but the climate is not likely to be as extreme as it is claimed by astronomers. Gross climate estimates are based on solar radiation, and not on the effects of cloud cover and atmospheric water vapor. On the other hand, in its very early history the Earth was apparently encased in ice. Some biological theorists have suggested this as an advantageous condition for the development of life-forms. 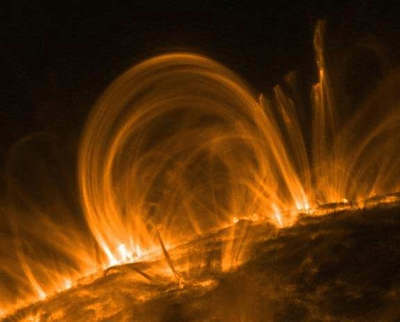 Magnetic fields are without doubt the most mysterious aspect of the planets. Nothing -- spin, size, density, or location -- seems to correlate with the magnetic field of a planet. Mercury, thought to have a metallic core, has only a very weak magnetic field. Venus should have a magnetic field since it is the same size as the Earth, but it does not. Yet Venus has a gigantic coma and plasma tail, usually indicated for a planet with a magnetic field. Mars should have a magnetic field since it is larger than Mercury, but has none. Jupiter's magnetic pole is upside down and ten times stronger than the magnetic field of any other planet. Uranus should have a magnetic field closely aligned with its axis of rotation, as other planets do, but the axis of its magnetic field is at right angles to the axis of planetary rotation instead. The Earth's ionosphere is actually a separate element, consisting of a shell closer to Earth, part of the much larger magnetosphere. I have here also neglected the toroidal Van Allen belts which encircle the Earth above the equator. Bacteria reproduce by simply dividing into two organisms, but will exchange their chromosomal material at times. They will also release their chromosomal material to the environment, encased in a shell. These packets might be the source for viruses, whose genesis is completely unknown still. "Bacteria trade genes more frantically than a pit full of traders on the floor of the Chicago Mercantile Exchange." Most bacteria reproduce very frequently. An exception is the methane-producing bacteria deep within oceanic muds near coastal regions, which are thought to reproduce only every thousand to ten thousand years. The outstanding parameter of life is that it reacts to the environment. This is true for single cells as well as complex organisms. Classical evolution theory would hold that this is the inadvertent outcome of repeated extinctions which "select for" those organisms which have the ability to adapt to the environment. Or so we think. In addition to the possibility that Saturn was responsible for "causing" speciation, the possibility exists that Saturn "brought" life. This is an element of panspermia, although without the notion that "comets bring life," thought to be elements of DNA in dried up bacterial or viral forms. There are no comets, only asteroids. All the asteroids are local to the Solar System. Only Saturn would repeatedly come from outside of the Solar System. Saturn would also spend an estimated thousand years traveling through the asteroid belt (in both directions). I consider the asteroids as consisting of the broken remnants of earlier planets, which may therefore have supported life. Size of this page: 9922 words.